Makenzie Meyer got her first start since Nov. 20, and she made the most of it. IOWA CITY, Ia. — Makenzie Meyer tilted her head up and beamed during the first media timeout of Iowa’s win against Illinois on Wednesday. Her little sister, Macy, who just celebrated her 8th birthday, was smiling and waving for the crowd on Carver-Hawkeye Arena’s big board as that night’s honorary ball girl. Makenzie walked over to Macy’s perch — right behind the Hawkeyes’ bench — and high-fived her sister before taking a seat. That’s one reason the elder Meyer had a good Wednesday night. The other: She earned her first start since Nov. 20 and set a career mark with 12 points on a career-best 4-for-5 shooting from long range to go along with a career-high four assists. The four made baskets mark — both overall and from 3-point range — was, yes, another career mark. "Makenzie obviously responded really well," coach Lisa Bluder said with a smile after the game. The Hawkeyes were plus-15 points when Meyer was on the floor, plus-five points when she was off. She’s been a quick burst of scoring and energy for a while now, averaging 7.1 points in 19 minutes in December and January. She started Wednesday in place of Christina Buttenham, who had gotten the nod since the Kent State game on Dec. 20. Buttenham averaged four points and 5.3 boards in 21 minutes as a starter. "I feel like Christina’s numbers have been better coming off the bench than they were in the starting lineup," Bluder said. "You know, giving somebody else an opportunity, we felt like we needed to do something different. But, mostly, it’s four days of practice and who’s practicing the best during that time?" It’s weird to call a 14-point, seven-board performance quiet. But that’s life when you’re traditionally as prolific as Ally Disterhoft, who rebounded Wednesday night after a forgettable performance against Penn State. She finished with three turnovers and four points on 2-for-9 shooting against the Lady Lions. That snapped a streak of 48 consecutive games in double figures for Disterhoft. 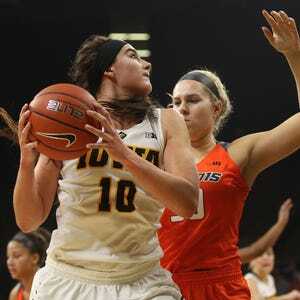 And it was just her seventh game scoring in single digits out of her 99 as a Hawkeye. The long-range shot still isn’t falling — she missed all four 3-balls against Illinois. But she went 5-for-6 on everything else. She played aggressively from the tip, scoring on a knifing layup seconds into the game and drawing three fouls inside throughout her team-high 32 minutes. Some Hawkeye fans might have held their breath a bit before the game, though. Disterhoft came out for warm-ups wearing a black wrap around her right wrist and thumb and she kept it on during the game. She had surgery on that wrist after her sophomore year, when she ruptured a tendon in that right thumb and wrist area and missed three months. But there’s nothing to worry about, Disterhoft said. "I just tweaked it in practice, so it’s really just precautionary," she said. "It just lingered a little bit. But nothing major." Disterhoft now has 1,819 career points, two points away from Michelle Edwards at No. 4 all time. Illinois outplayed Iowa in the second quarter. It out-rebounded Iowa 14-12, outshot Iowa 40 percent to 22 percent, and until the final seconds, outscored Iowa 14-11. With 2.4 on the clock, the Illini tried a full-court pass to get off a last-second 3-pointer and maybe enter halftime down just 36-27 after trailing 28-10 early in the second. Kathleen Doyle got in the way. She vaulted into the air at midcourt to intercept the pass. Then she wildly raised up for a final-millisecond heave that probably had no shot of going in. Courtney Joens smacked Doyle's arms — this was the kind of desperation shot that never earns a call, though. But the ref blew her whistle. The foul actually got called. Doyle sunk all three free throws to give Iowa a 39-24 halftime lead and all traces of momentum. "I didn’t think they were going to give me three free throws, but I wasn’t complaining," Doyle laughed. "I was trying to shoot, but I didn’t think I was going to get that call." Another smart play from a freshman making a solid case for the Big Ten All-Freshman team.